great collective efforts of the entire FPMT family. 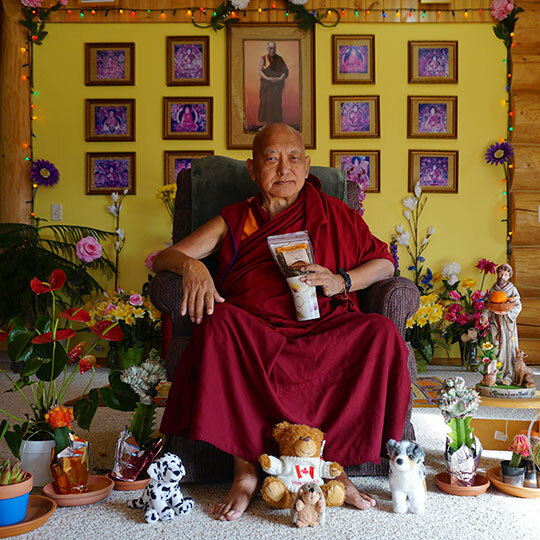 Lama Zopa Rinpoche and friends send you warm season’s greetings! Washington State, USA, November 2016. Photo by Ven. Lobsang Sherab. “Don’t harm yourself and don’t harm others—practice the good heart towards others. This will bring peace and happiness to all living beings in this world, to your own family and lastly, to you yourself. Mandala Magazine: New Online Feature! There’s Still Time to Give a Gift That Helps Others! Have You Used the New Affiliates Area Yet? Lama Zopa Rinpoche preparing to give his first teaching at this year’s November course, Kopan Monastery, Nepal, November 2016. Photo by Ven. Lobsang Sherab. 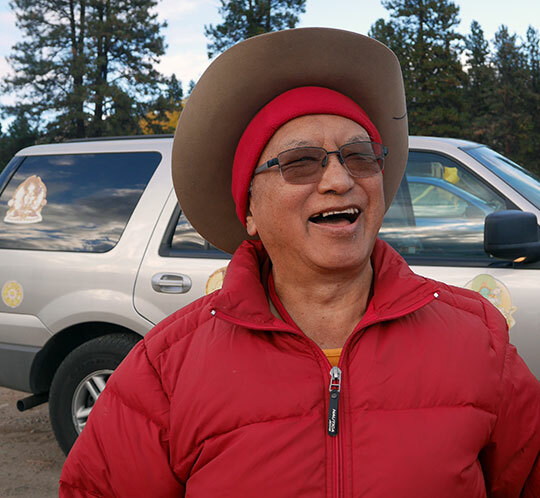 Lama Zopa Rinpoche preparing to go out on the water to bless Omak Lake, Washington, USA, November 2016. Photo by Ven. Holly Ansett. Rinpoche showing the relic of the self-emanating Chenrezig, Kopan Monastery, Nepal, December 2016. Photo by Ven. Lobsang Sherab. 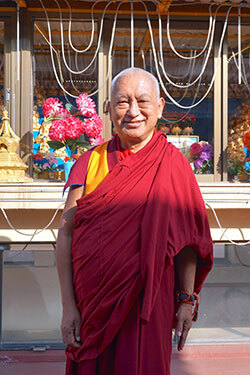 Lama Zopa Rinpoche on his 72nd birthday according to the Tibetan system (71st Western birthday), Kopan Monastery, Nepal, December 3, 2016. Photo by Ven. Lobsang Sherab. Collection season for Merit Box offerings begins on December 23, Lama Tsongkhapa Day. This is the best time to count up and send in the Merit Box offerings you have been accumulating throughout the year. Merit Box donations will go to fund grant opportunities in 2017 for Dharma projects around the world. Learn how to submit your offerings here. Tong-nyi Nying-je Ling, Denmark, will start their first Basic Program in January with FPMT registered teacher Ven. Sangye Khadro. The program will be offered in English and will also be available online. 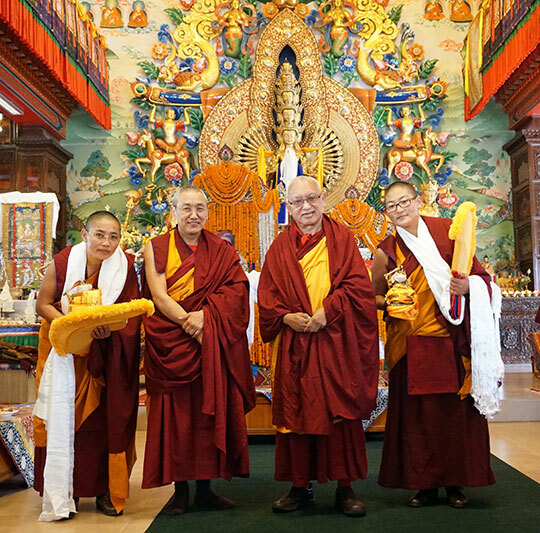 Nalanda Monastery and Centre Kalachakra in France have each completed their second BP. In Dorje Chang Institute, New Zealand, four students of the first BP completed the three-month review and passed the BP final exam while the second BP is already in progress. For the past two years, Kopan Monastery has taken on the responsibility of supporting Sagarmatha Secondary School in Chailsa, Nepal. The school is located on what was once a Tibetan refugee camp and currently serves 120 young students. Parents of the children, who are ethnically Tibetan or Sherpa and come from meager means, requested Kopan to accept management of the school when funding for this school was no longer available. Understanding that education is key for breaking the cycle of poverty, Kopan accepted the request to take on responsibility for the school as well. We invite you to rejoice with us that the school was funded during 2016 by a grant from the Social Services Fund. Read more about the plans for this school and the details of this recent grant. Please enjoy Mandala’s newest online feature, “Dhi! Ven. 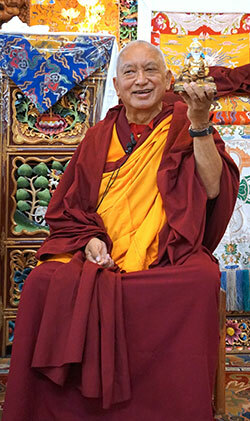 Tenzin Namjong on Debate, Study, and Life at Sera Je.” In it, Sera IMI monk Ven. Tenzin Namjong (Matthew Pasion) discusses with Mandala how debate fits into the geshe program at Sera and its power for transforming practitioners. Also, find our three most recent online features—“Strasbourg, France Hosts His Holiness the Dalai Lama,” “Human Spirit: Bridging Buddhism and Psychoanalysis in Israel,” and “Cultivating Compassion: Geshe Thupten Jinpa Brings Dharma into the Secular World”—in our online features archive. The FPMT Foundation Store carries a full range of meditation supplies and holy objects including offering bowls, vajras and bells, bumpas, mandala sets, statues, thangkas and more for your practice needs. Check out our end-of-the-year special discounts! Vens. Jangchub Gyalmo and Namdrol Phuntsok on the second day of the geshema debate at Khachoe Ghakyil Nunnery, Nepal, with Khen Rinpoche Geshe Chonyi and Lama Zopa Rinpoche, November 2016. Photo by Ven. Lobsang Sherab. 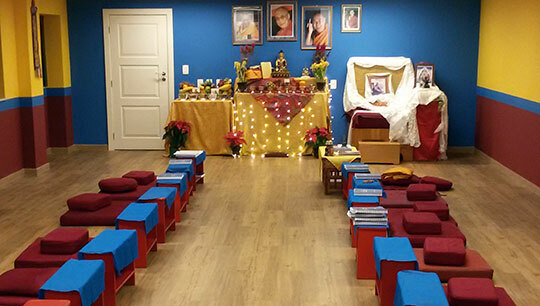 The Affiliates Area is for FPMT directors; board/executive committee members and trustees; spiritual program/regional/national/study group coordinators; registered teachers; Basic and Masters Program teaching assistants and coordinators; and FPMT Service Seminar registered facilitators. It has been designed with a powerful search function and intuitive links throughout to make it much easier for you to find the information you need. If you have any questions or have not received your invitation, please contact Justin Jenkins. Lama Zopa Rinpoche meeting the incarnation of Khensur Rinpoche Lama Lhundrup for the first time at Kopan Monastery, Nepal, with his parents and Ven. Khunkyen, November 2016. Photo by Ven. Lobsang Sherab. 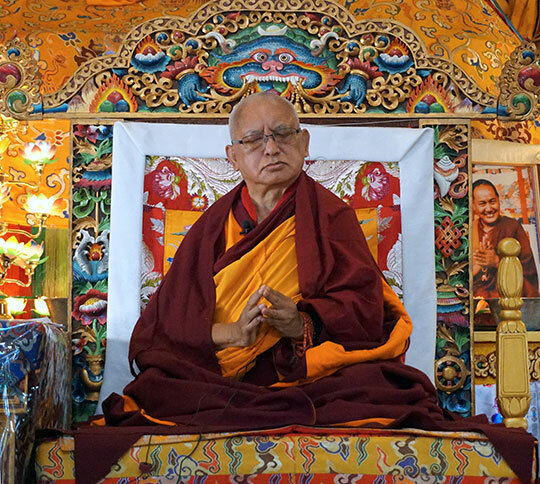 The FPMT organization is continuing to help to fulfill Lama Zopa Rinpoche’s Vast Vision of offering service to His Holiness the Dalai Lama. Recently, Tushita Mahayana Meditation Centre hosted His Holiness at their Delhi Dharma Celebration! And Amitabha Hospice Service requested His Holiness to be their Patron—and His Holiness accepted! Congratulations to Centro Shiwa Lha in Rio de Janeiro, Brazil, as they inaugurate their new center building! Please check out the regularly updated meritorious opportunities to offer service as a volunteer or as paid staff in FPMT centers, projects and services around the world. Jamyang Buddhist Centre, UK, has an opportunity to serve as spiritual program coordinator; Land of Joy, the UK retreat center, is looking for volunteers in 2017.